Back when the days were long and the evenings were light, when Scotland was warm (no, really) and the sun shone down on the River Tay, the City of Glasgow Chorus spent a weekend locked in the Caird Hall. Never has the Greggs on Dundee High Street done such a roaring trade in cups of tea. 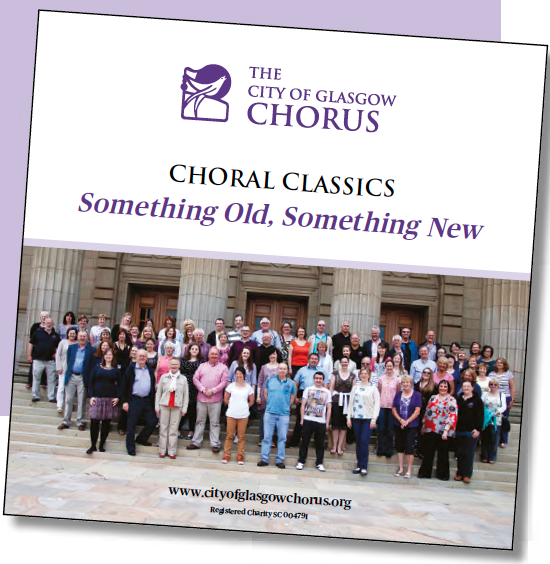 The result of those two days is the new CD, Something Old, Something New, which is available now for postal ordering from the Chorus website for £10. If you know a Chorus member, it can also be got from us with less hassle and no P&P charge. The playlist includes the Charles Parry I Was Glad, choruses from the Faure Requiem and Mendelssohn Elijah, Howard Goodall’s setting of Psalm 23 (from The Vicar of Dibley), the Vivaldi Gloria, and the Bogoroditse Devo from the Rachmaninov Vespers. It is very good music, with a very good choir (and I’m biased and I don’t care) and a magnificent organ. I heard this in its finished form a couple of weeks ago and then parts of it again when I was driving home tonight. I’m very proud of the work that went into it by all of us, and of the quality of the end product. Everyone likes a nice CD for Christmas. This entry was posted in Blog and tagged city of glasgow chorus. Bookmark the permalink. Okay, why take the “City of Glasgow” Chorus to Dundee? Even for the weekend? Nowhere in Weegieville that would tolerate you? I think it was so we could play with the Caird Hall organ. We’re planning to go to China at some point in the next couple of years. If you were thinking Dundee was ridiculous. Oh, good; I was hoping someone would give me a heads up when this was ready. Just let us know how to arrange it, please – we’d love a copy! I’ve sent T. an email.